Providing you the best range of static eleminators with effective & timely delivery. Aimed at prosper growth in our domain, we are engaged in manufacturing and supplying an excellent quality Static Eliminators. 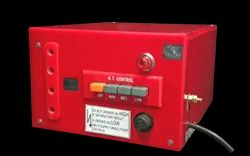 This static eliminator plays a key role in destroying the static charges which are caused or produced during the operation of a high-speed machine. Our offered static eliminator is extensively used in extruded tube, film plant, tape plant, cutting and sealing machine. Moreover, offered static eliminator is provided in number of specifications to choose from.